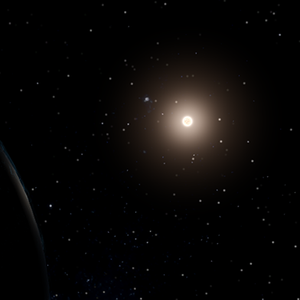 The Natuna Bhūmi Bariśāl system consists of four major planets in relatively close orbit of an F-type main-system star marginally larger than the Sun and about 50% brighter. 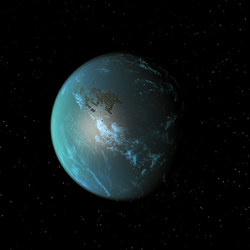 The main colony exists on the third planet from the star, Natuna Bhūmi Bariśāl. Originally established as a xenobiological outpost, the planet’s semi-safe conditions attracted large numbers of frontier colonists who saw appeal in life on the furthest extent of human civilisation. The research outpost was later converted into a residential habitat, incorporating several surrounding homesteads into the settlement closest resembling a true city in the system. The majority of the population live in scattered, often cheaply constructed habitats ranging from housing single family units to communities of a few hundred people, mostly self-sufficient by necessity. Gentle terrain means that surface transport is quite trivial, with rough roads having formed naturally over the course of the colony’s existence, though travel without a suitable vehicle is quite impossible. Atmosphere for habitats is easily produced from the planet’s own thin air, with most settlements generating their own with one or more large, cautiously maintained converters that dot the surface wherever life is to be found. The population of Natuna Bhūmi Bariśāl is one of the most mixed between human and Skrell in the galaxy. Originally a human colony, the frontier world began accepting Ue-Katish refugees in protest of SolGov immigration policy in 2413, and seceded from the government as a result. Currently, the split is approximately 40-60 humans to Skrell, though this fluctuates with some regularity. Positronics also make up a small portion of the population, as the colony acted as a largely neutral ground during the period when their rights were in serious doubt. Most settlements on the planet are relatively self sufficient, though smaller communities rely on trading what they are able to produce - usually food or services - for harder to obtain items such as equipment and machine parts. Some small regional organisations have formed which offer skilled services such as medical care in exchange for whatever a community is able to provide. Some larger townships have been known to sponsor surrounding habitats which are unable to provide for themselves in this regard, with the usual expectation that the favor be returned however possible. The planet has been under large-scale embargo from both SolGov and most Skrell city-states for over a century, and as a result has been in a state of worsening poverty even since. Acquiring new gear or parts has become almost impossible without paying the inordinate prices offered by opportunistic smugglers. Lacking large scale industry, many have learned to make replacement parts from scrap materials and these stand-in parts are in high demand across the system as the entire population struggles to maintain century-old machinery upon which their lives very literally depend. Natuna Bhūmi Bariśāl lacks a formal centralized government, with settlements in the system remaining almost entirely autonomous. Most human-run townships hold local elections for peacekeepers and spokespeople, with the exact power these individuals hold varying from place to place, while even the Ue-Katish Skrell maintain a rigid hierarchical structure within their communities with clear roles set out for each member. In both cases troublemakers are often dealt with harshly by vigilante justice. A group of planetary spokespeople are elected from the population of the largest settlement of Natuna Bhūmi Bariśāl on a five-year basis. Voluntary representatives from other communities are welcomed to advise on matters of planetary and international importance. While the spokespeople have final say, it is often in their best interest to represent popular opinion. 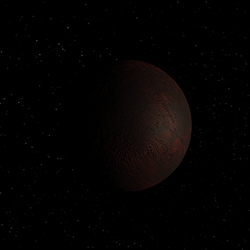 A hostile, volcanic world in close orbit with the system’s star with surface temperatures exceeding 500 degrees celsius, rendering it entirely inhospitable. A slow decaying orbit means the planet is expected to be consumed by the sun, given another few million years. A barren, rocky world with surface temperatures ranging from -140 to 330 degrees celsius with the fairly quick rotation of the planet, a day lasting roughly two earth weeks which renders mining operations difficult, but not impossible. Multiple facilities are kept in operation on a cycle as subterranean mines are able to safely support workers during the night, but become dangerously hot as the surface heats due to lack of sufficient equipment to keep them cool. The mines produce mostly base metals, which are used almost entirely in the operation of the main settlements on Natuna Bhūmi Bariśāl. 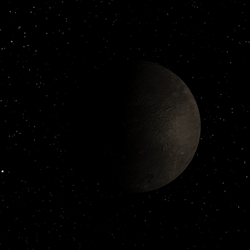 Natuna Bhūmi Bariśāl orbits third from the system’s star and is the main settled planet in the system. The planet possesses a thin nitrogen-rich atmosphere and approximately 85% surface water coverage. The warm average surface temperature of 35C supports simple aquatic life in the form of photosynthesizing cyanobacteria which release oxygen into the developing atmosphere. The absence of any major natural satellites mean tides on the planet are extremely minor. Settlements primarily exist on the two rocky main continents, which support some species of particularly resilient introduced algae, though artificial atmospheres are required for safe human and skrell habitation. 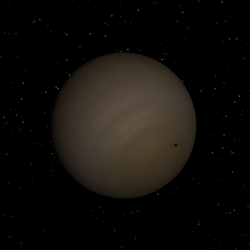 Significantly further from the star than the rest of the system’s planets, the pale brown gas giant Khondakar - named for the chief researcher on the system’s original human xenobiological expedition - consists primarily of swirling hydrogen gases in a state of constant motion generating enormous electrical storms. Only recently, a small orbital refinery was established to provide cheap “emergency” fuel for ships in the system. 2290: Bacterial life discovered in the ocean of Natuna Bhūmi Bariśāl by a Skrellian science expedition. 2301: Semi-permanent subaquatic research outpost established by Skrell scientists. 2326: First contact between humanity and Skrell. The system now finds itself close to the worlds of another civilisation.The outpost is abandoned, citing unsafe political conditions. 2339: Ocean life is confirmed by human science vessel SCG-S Searchlight, and the planet flagged as a potential site for colonisation. 2341: Natuna Bhūmi Bariśāl is codified as one of the systems just within the border of human space. 2355: First human outpost established by a team of xenobiologists from the University of Bariśāl on Earth. The planet gains its present-day name. 2363: The relative ease of establishing habitats on Natuna Bhūmi Bariśāl means the planet becomes a popular destination for frontier colonists, and becomes littered with numerous cheaply domed homesteads. 2375: The university research expedition officially comes to an end. A few team members stay behind, and the outpost is opened to public habitation. Several surrounding homesteads are incorporated to form the planet’s first major settlement. Immigration swells. 2378: As population grows, the colony establishes an elected council to handle outside contact. The colonists vote overwhelmingly against establishing a traditional government. 2382: Unauthorised contact is made with Natuna by a Skrell research vessel. Rather than report the contact, biological survey data is quietly exchanged. The incident goes undocumented for over 30 years. 2396: Small mining operations are established on Dhana in order to support the growing population of Natuna Bhūmi Bariśāl. 2400: Trade officially established with nearby Skrell systems on a limited basis. 2413: Inspired by the legal success of the Mercurial colony of Shelf, Natuna Bhūmi Bariśāl secedes from SolGov, welcoming Skrellian refugees and establishing trade with Skrell untouchables, much to the distaste of the Qerr-Katish. 2420: Trade restrictions are placed on the colony by the majority of Skrell city-states. The economy falters. 2421: Natuna Bhūmi Bariśāl refuses an offer of annexation from SolGov. Foreign aid is received from Shelf, stabilizing the now isolated colony. 2426: Natuna Bhūmi Bariśāl remains a popular destination for Ue-Katish refugees despite official restrictions. The colony becomes known as a safe harbour for Ue-Katish fleets, provided peace is maintained while in the system. 2435: The Skrell open their borders to human immigration in response to the unexpected success of Natuna Bhūmi Bariśāl. SolGov respond in kind by the end of the year. Embargoes on the colony remain in place. 2466: Control of the colony is briefly seized by infamous Skrell pirate Qar’raqel, openly declaring himself Emperor of the system. Less than one month into his rule his ship, the Hushed Whisper, was destroyed by a catastrophic engine failure and the colony returned to its decentralized system of rule. The exact circumstances of his death have become a popular subject in the public mind. 2482: Gas extraction begins in Khondakar orbit, suitable for low-grade ship fuel. 2489: A number of Skrell city-states offer to lift their embargo in exchange for the expulsion of the Ue-Katish. They are not given an answer. 2508: Natuna Bhūmi Bariśāl quickly becomes a destination for refugees anticipating escalation with the Unathi. 2511: The colony is denounced by Skrell and human governments for accepting deserters and conscientious objectors. 2550: SolGov officially pardons those who fled to Natuna Bhūmi Bariśāl in the war. Of those who remain, just under one quarter choose to return home.